Congratulations to Alex Watson-Lazowski, who recently passed his PhD viva with minor corrections. Alex was based in the Taylor Lab at the University of Southampton, where he applied Next Generation Sequencing to understand acclimation and adaption of Plantago lanceolata to a changing environment - and learnt a lot about the challenges of using RNA-Seq data without an available genome sequence! Alex will be moving to Australia in July to take up a postdoctoral position in the Hawkesbury Institute for the Environment at the University of Western Sydney. 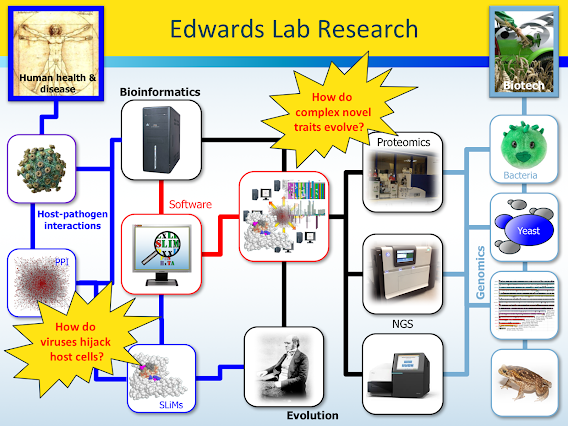 Research interests in the Edwards lab stem from a fascination with molecular basis of evolutionary change and how we can harness the genetic sequence patterns left behind to make useful predictions about contemporary biological systems. The core research in the lab is the study of Short Linear Motifs (SLiMs), which are short regions of proteins that mediate interactions with other proteins. This research originated with Rich’s postdoctoral research, during which he developed a bioinformatics (sequence analysis) method for rational design of biologically active short peptides. He subsequently developed SLiMDisc, one of the first algorithms for successfully predicting novel SLiMs from sequence data - and coined the term “SLiM” into the bargain - before developing the first SLiM prediction algorithm able to estimate the statistical significance of motif predictions (SLiMFinder), which greatly increased the reliability of predictions. SLiMFinder has since spawned a number of motif discovery tools and webservers and is still arguably the most successful SLiM prediction tool on benchmarking data. Current research is looking to develop these SLiM prediction tools further and apply them to important biological questions. Of particular interest is the molecular mimicry employed by viruses to interact with host proteins and the role of SLiMs in other diseases, such as cancer. Other work is concerned with the evolutionary dynamics of SLiMs within protein interaction networks. Another area of research concerns the post-transcriptional regulation of protein expression. In collaboration with Dr Mark Coldwell (University of Southampton), we are asking the question: how does the ribosome choose where to start translating a protein? By combining bioinformatics screens with laboratory reporter assays, we are identifying proteins that are translated from non-canonical and/or multiple initiation codons. Possible roles of N-terminal variability in protein interactions and subcellular localisation are now under investigation. 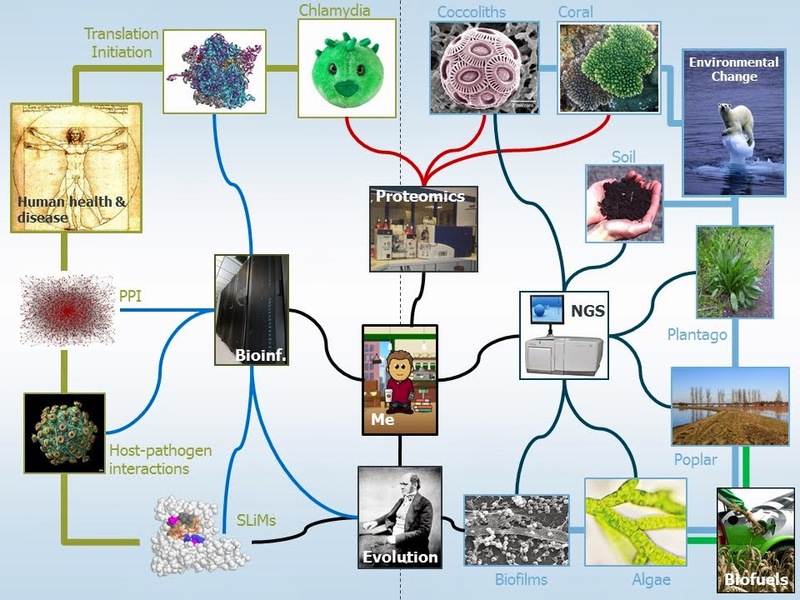 Finally, the lab has a number of interdisciplinary collaborative projects applying bioinformatics tools and molecular evolution theory to experimental biology, often using large genomic, transcriptomic and/or proteomic datasets. These projects often involve the development of bespoke bioinformatics pipelines and a number of open source bioinformatics tools have been generated as a result. A new download of SLiMSuite (release 2015-06-01) is now available. This is the first release in the new git repository at https://github.com/slimsuite/SLiMSuite. A tarball slimsuite.2015-06-01.tgz is also available, containing the same code. Once unpacked, it should be possible to pull down additional updates with git.